The train ride from Rome to Pisa was supposed to be a relaxing journey as we had a lot of time. After taking our breakfast we did a quick shopping round but didn't buy anything. We walked over to the nearby railway station and had a lot of time to wait before the train left. 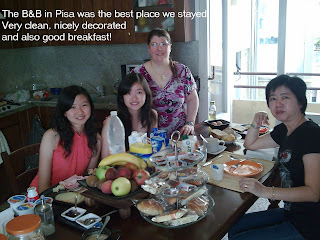 We kept looking at the board but they didn't seem to show the platform to Pisa so we thought there was a delay, again. When it was around 15 or 20 mins to board the train, the info came out. We quickly made our way to the platform which was quite a distance away. When we finally reached the platform, we asked the conductor which coach to board. To our horror, she told us we were on the wrong platform. We quickly turned back and walked as fast as we could because the train was supposed to leave in 5 mins. Luckily, another conductor pointed to us that the train was just on the next platform. To make sure, I waved at the driver and showed him our ticket. He nodded his head and shouted something and pointed to the back. So we quickly boarded the nearest coach and slowly made our way to our coach. We barely sat down for a few minutes before the train moved. At first we weren't sure whether we were on the right train, despite the driver's nod, but later when the conductor came to check the ticket, we sighed a relief and sat back to have a proper rest. We learnt our lesson. Trains are not like planes! We should check the train number rather than check the destination when looking at the schedule board! Our train to Pisa was actually to a further destination. Luckily the platform was just next to it, otherwise we'll have to get a refund and then get new tickets. Our B&B was just outside the railway station. This was the best place we stayed in on our Europe trip. The 2 connecting rooms we took only cost 130 euros with breakfast and the place was spotlessly clean and tastefully decorated. Moreover the owner Michel is such a nice guy who gave us good tips and guide to visit Pisa. Pisa is famous for the Leaning Tower. It takes about 20 mins to walk there from the railway station. Michel told us not to take the bus as the bus will take you a big round to get to the Tower. He was right, the streets were so narrow no bus can get in. Everyone seems to be walking in the heart of the old town. By walking we get to see more of the town, and enjoy the scenic views on the bridges and River Arno. This is the Scoula Normale Superior, actually a university for post graduate studies. Many famous Italian scientists supposedly studied here. There isn't really much to see in Pisa, but the visit was worthwhile. Actually the real beauty is the cathedral beside the Leaning Tower. It was such a pity that the Leaning Tower took away all the glamour. Anyway, we had a lot of time to take pictures, front view , side view, leaning view, upright view, day time view, night time view! When you see it at night it is even nicer. The interior is also very nice, but after seeing so many beautiful cathedrals in Paris and Rome, we were not so fascinated anymore.